Some analysis, however, is simple. Manchester United are going to miss Sir Alex Ferguson. I know, I know… it’s obvious. If I was going to write a lengthy paean to Fergie’s amazingness, I kind of missed my window, right? There were so many good ones when he announced his retirement, ones with writing far beyond my skill level and stories I never knew to tell, that there isn’t space for another one. Honestly, I wouldn’t want to try. So when I say that ManU are going to miss Fergie, I mean it a way few people will have discussed. The stuff Manchester United were doing offensively under Alex Ferguson was analytically unique across the entirety of Europe. The vast majority of teams rely on shooting the ball as much as possible while trying to make the opponent shoot as little as possible. But not all. We analysts have been lumping United and Barcelona together as tactically and analytically different. And they are… sort of. The problems arise when you try to analyse them with the tools we use to analyse and predict normal teams. It took a while, but after running their numbers through a couple of different models, I can actually get pretty close when it comes to Barcelona. The model still thinks they are about as good as Real Madrid, but they are way, way ahead of the rest of the pack in La Liga. Tiki-taka is fascinating, but once you know how to look at it, you can kind of figure it out. United, on the other hand, are analytically inexplicable. I’ve walked through almost every predictive model I can find, and the closest anyone can get them is fourth. That’s Alex Ferguson. 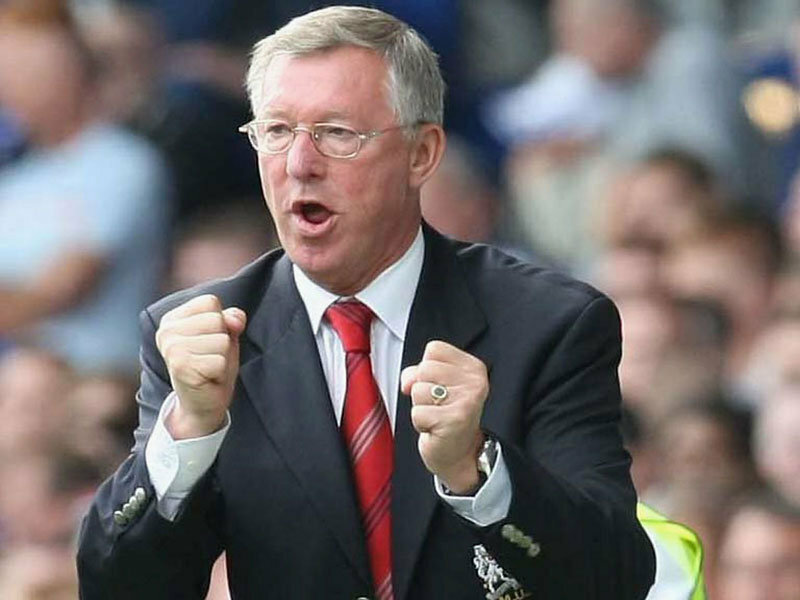 Fergie was one of the most innovative, adaptive, and genius tacticians football has ever seen. The funkiest thing about United’s offense in recent seasons is that no one really seemed to notice it was so different. Sure, maybe they were a little more patient in the build-up play. Or not. Scholes was still there pinging long balls to the wings, and switching play. Sure, maybe Fergie invented some sweet post-up play for 1-2s in and around the penalty area. Or not. They still had fast guys running a lot, and amazing finishers up front scoring goals. I read a lot of stuff, and I enjoy the hell out of a good tactics blog. I haven’t really seen anyone pick apart all of the cool, interesting, +EV stuff that went into United’s offense. Maybe there wasn’t anything. It was United’s offense. They kick the ball around, crossed it sometimes, moved a lot, got into good shooting spots all the time, and scored a lot of goals. That’s football, right? Boiling it down and looking at the numbers, what Fergie got out of those inputs is different than anything I have ever seen. And that is what David Moyes has to replace. This is fairly easy to sum up in an image. That’s great on both sides of the ball. Conceptually, United could do with taking a few more shots per game and giving up a couple less, but they are a surgical strike team and not bombardiers. They are almost impossibly good at making the chances they get count, and they ran away with the league last season. 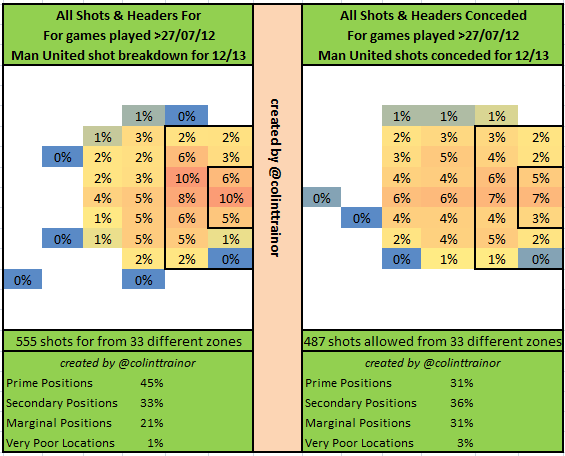 Ben Pugsley recently looked at United’s performance from corners (link), and oh boy were they good. Can that carry through to another season with the same personnel on the playing field? We’re certainly going to find out. Fergie’s gone and no one knows quite how well Moyes will fill that hole. Moyes has always been good at coaching defense. On the other hand, we have no evidence that his offenses have ever been better than average. If he can learn from the old Scottish master and keep that offense relatively intact while adding his defensive principles, United could be awesome. If he can’t, they might merely be good. Merely good hasn’t been seen at Old Trafford in a generation. Cup competitions were an issue last year. Bowing out in the round of 16 of the Champions’ League (to an admittedly tough draw of Mourinho’s Real Madrid), and then to Chelsea in the sixth round of the FA Cup was a disappointment to the faithful at Old Trafford. Is the squad good enough and deep enough to do better this year? I have some doubts. The last few years, Fergie was playing the managerial game on hard mode. Money was spent, but almost none of it on recognizable stars. Instead, most of United’s signings came in the form of talented younger players to stock the storeroom for the next generation. Given the frugality, it’s not a huge surprise then that United have some fairly glaring holes in the squad, mostly caused by age. Michael Carrick – almost certainly United’s MVP last season – is now 32. Premier League golden boot winner Robin van Persie recently celebrated his 30th birthday. Rio turns 35 this season, Vidic 32, Evra is 32, and Paul Scholes re-retired at age 38. Even the ageless Ryan Giggs can no longer outrun the career chronometer. His 39-year-old season saw him start only 12 league matches with 10 substitute appearances, his lowest contribution in 22! years. The stalwarts of Fergie’s last United era are officially o-l-d.
Defensively, United should be fine. Buttner and Rafael are a helluva fullback pairing already, and even with Vidic and Rio getting older in the center, they are backstopped by a good trio in Evans, Jones, and Smalling. The big worry comes when looking at the midfield. Anderson simply cannot stay healthy. Cleverly has a similar problem, and Fletcher’s unfortunate condition robbed United of an excellent player. Carrick has been a rock, but there is zero useful cover in that spot. The fact that Fergie won a title with that midfield might be his most impressive work. Obviously all of this explains there prolonged attempt to sign Thiago (stolen away to Bayern by his idol Guardiola), and subsequent more desperate attempts to find other passing options. Should he be signed, Fellaini will add a useful physical presence to the center, but you gotta think United need more than just one body. It’s strange to me that a saga that started well before the season ended is still going on a week before the new season starts. United don’t seem to want to sell (and they shouldn’t), but Rooney doesn’t want to play for Moyes. They didn’t get along in the past, and I suppose he thinks they won’t in the future, so he wants out. Simples. If it were me, I would have wanted to assess and resolve this quickly, so that the club could move on and Moyes could avoid the distraction. That obviously hasn’t happened. 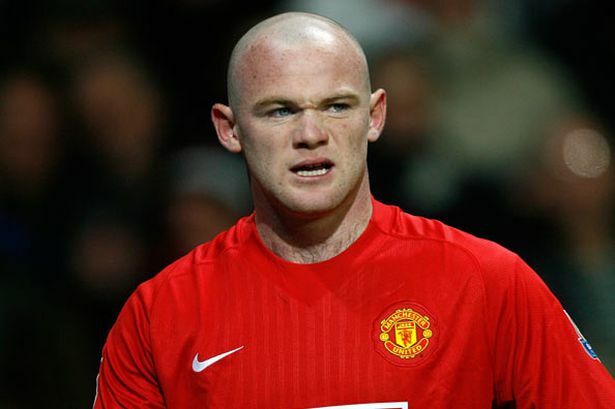 Losing Rooney would not be the end of the world. United already have Kagawa ready to fill most of Rooney’s role (at least the one he played last season). None other than Jurgen Klopp has suggested he’s one of the best goal-scoring midfielders he’s ever encountered. That said, Rooney is a footballing genius. When motivated, there is almost no one like him, and at this point in the window United would have trouble finding anything remotely like value for money in that position. In the past, Moyes has been deliberate almost to a fault when it comes to transfer dealings. Much of that was caused by the razor-thin financial margins he operated under at Everton, but doing the same thing at United may end up costing them big. United need a top calibre passer or two in midfield. They also either need a healthy, happy Wayne Rooney, or a reasonable replacement. Look, David Moyes probably has the most impossible replacement act English football has ever seen. Not only is he taking over for a legend, but he’s now competing against Jose Mourinho and Manuel Pellegrini in control of teams with massive budgets, and Spurs and Liverpool are the best they have been in years. (Silver lining: Arsenal are not.) I think he’ll do okay, but teams often take time to bed in with new managers and tactics, and the competition is unlikely to provide that luxury. Combine that with the fact that United seem a bit short of quality in key areas and have yet to make any major transfer moves this year, and defending the title seems out of reach. Winning the Premier League is a big ask in the best of times, and even Fergie would find the odds strongly stacked against him this season. To put it another way, United were almost inexplicably good last year. Everything about David Moyes suggests that he operates in the world of muggles. Fergie was secretly headmaster of footballing Hogwarts.